Nicolás Correa S.A. is aware that a context of economic uncertainty, because of the need for differentiation to survive on an increasingly competitive market, and because of growing concern for environmental and social issues among governments, companies and society in general, calls for a combined management of both factors in order to mitigate risks and take opportunities with a view to improving our performance year by year and to guaranteeing prosperity for both our shareholders and our company structure. In line with this understanding, an Environmental Management System to the ISO 14001 Standard has been implemented in the production plants of Nicolás Correa in Burgos. This ISO certificate recognises and certifies that the production centres are managed according to quality standards, respecting the environment beyond the requirements currently in force in the European community and in Spain. The environmental management system implemented in the production plants is an all-encompassing system and covers the entire production process. The priority of these procedures lies in the protection of the air, water and land, a rational use of natural resources, minimum generation and a correct disposal of residues, saving energy and raw material. The ISO-14001 certification fits in the framework of our corporate policy and culture which is strongly committed to nature conservation and protection, as well as to sustainable development of the autonomous community in which we are located. Our management strategy, based on responsible action and the pursuit of excellence, has prompted Nicolas Correa to establish ECODESIGN as a methodology required for the machine tool sector to reduce the environmental impact of both its own actions and those of their customers. 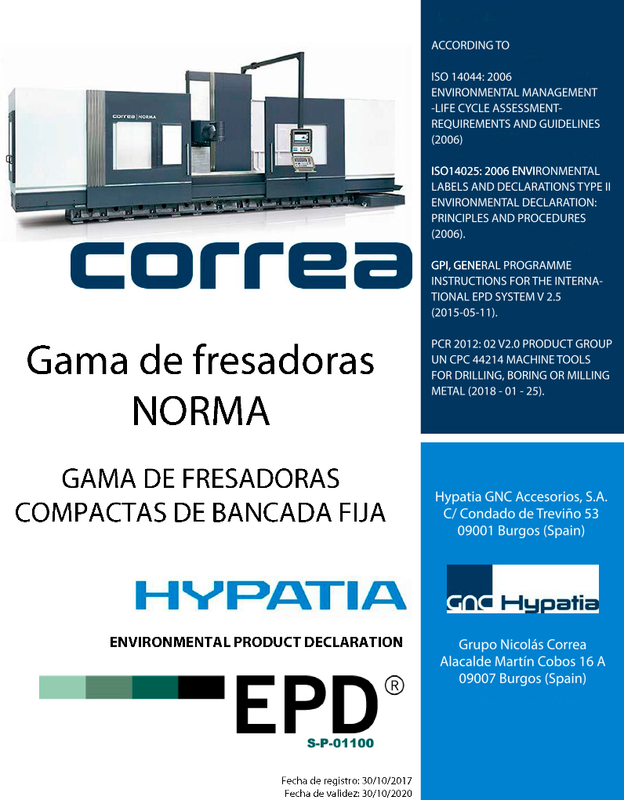 Nicolás Correa S.A. was the first large milling machine manufacturer to gain EPD (Environmental Product Declaration) environmental certificates for its products. Applying these design concepts to the machine bears in mind safety criteria, ergonomics and minimum environmental impact from conception to scrapping, hence optimising the cost of the complete life cycle of the machine. 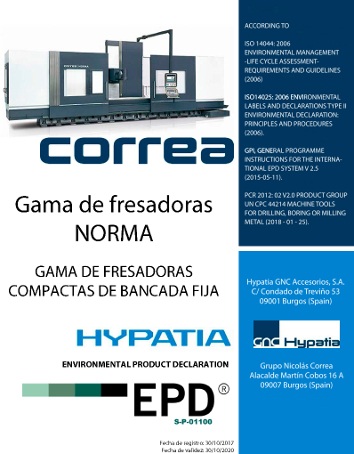 As part of this sustainability strategy, Nicolás Correa has introduced two machine functions in all its machine models, which directly affect the amount of energy consumed by the milling machine throughout its working life. Función Stand-By: If the milling machine, while on, is not used for more than a specific period of time (this can be adjusted), then the machine enters stand-by mode, in which power consumption is reduced to the bare minimum. This enables a 15% reduction in energy consumption due to downtime. Auto Switch Off function: The machine can be programmed to switch itself off automatically, a very useful function in workshops in which the machine is unmanned during the night shifts. This function guarantees that the machine only consumes power when actually manufacturing parts.